To add subtitle to MP4, first of all, you need to find external subtitles. Here are top 5 reputable sites to download subtitles for free. Just make sure your searches are precise in relation to quality and language. 1) Create a new folder. 2) Drag both MP4 video file and SRT subtitle into the same folder. 3) Rename subtitle file as the same name as the video file. 4) Play the video with your media player. 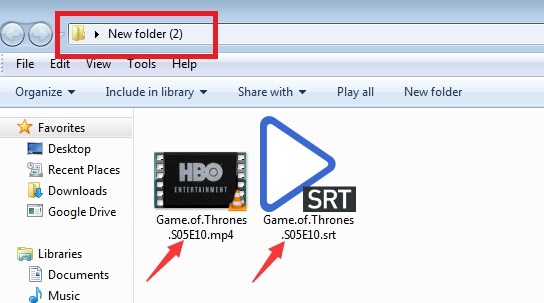 Note: For instance, if your video is named "Game.of.Thrones.S05E10.mp4", the subtitle should be "Game.of.Thrones.S05E10.srt" or other subtitle format extensions. Both of the two files must be in the same folder. But for some special video and subtitle formats, method 1 might not work very well. So you can load subtitles via media player while playing videos. Here we take frequently-used VLC for example. 1) Play your MP4 video file with VLC. 2) Press "Subtitle" on the menu bar and choose "Add Subtitle File". 3) Load subtitle file you've downloaded. With the help of Method 1 and Method 2, you can successfully add subtitle to MP4. But only if you have both video file and subtitle file, besides, it is only limited on desktop computers since it's unavailable or not convenient for smartphone, tablet and other devices. Such as playing videos on iPad mini 2, converting and watching DVD to iPhone 6, playing MKV video on Samsung TV, etc. To embed srt to MP4 permanently, you may fall back on the third-party software.